A senior Microsoft executive has spoken out over the rival YouTube service it is launching in tandem with its former rivals. The comments come as Microsoft signs a major content deal and re-thinks its MSN Soapbox video service during a two-month new user hiatus. News Corporation (Fox) and NBC Universal are the main players behind the new YouTube -rivalling service, which is also expected to use content from Viacom. The companies will launch a free online video website later in the year and most of the required content is reputed to be full-length TV shows and films. But the new service will also show content on the web portals of three of Google's main competitors - Yahoo!, AOL and Microsoft's MSN. Kevin Johnson, head of Microsoft's Platform and Services Division, said the announcement was "a great win" for MSN's user base. The legendary site now has more than 460 million users worldwide. "Our investments in MSN Video and Soapbox over the past couple of years have shown us that video is an amazing driver of user engagement and excitement, both for consumers and for advertisers, said Johnson, papering over the fact a certain Google-owned company had really shown people the online video light. 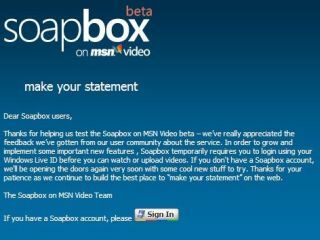 In order not to alienate its new buddies, Microsoft has called time out on new users signing up to its MSN Soapbox service. The YouTube-esque site enables users to upload video, but it has placed a ban on new users. You hardly have to be an expert in Pure Maths to see why - the site launched in Beta last month and, since then, thousands of unauthorised clips have been uploaded. "We...share with our colleagues in the content industry our vision for delivering easy access to great content for consumers while accommodating critical copyright and intellectual property protections," continued Johnson. "We look forward to the summer when the content library comes online, and MSN users can tune in and watch the videos they love."